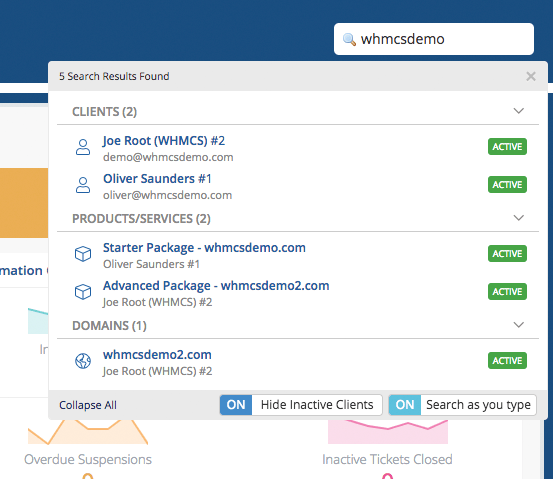 Intelligent Search is one of the most highly used features of WHMCS. 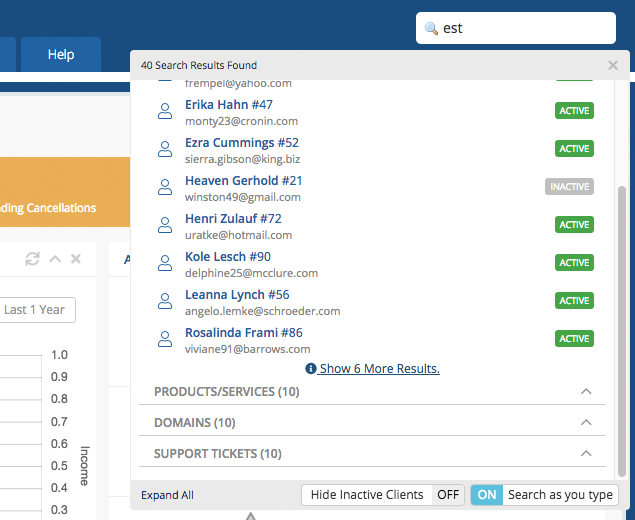 Accessible from every page of the WHMCS admin area, intelligent search allows you to search your WHMCS instance for clients, contacts, services and more from a single search field, quickly, easily and with minimal clicks. In WHMCS 7.7, we've given Intelligent Search a fresh new look and addressed a number of recent feature requests. In this blog post, I highlight some of these changes so you can make the most of them post upgrade. Search results will now be returned as you type, giving you the results you're looking for faster. Want to restore the previous behaviour? No problem, a new toggle option within the search results popup allows you to do just that. Your selection is remembered for the duration of your admin session. Where previously intelligent search would only give you the top 10 matching results for each entity type within a search, now Intelligent Search will let you know if more results are available and allow you to expand and view them any time you need to. We've added more search fields to the list of things Intelligent Search covers, including data attributes such as Tax and VAT IDs, Assigned IPs, and more. Inactive clients will now be hidden from search results by default, prioritising active current clients in search results. Looking for an inactive client? No worries. Simply toggle the Hide Inactive Clients slider to include inactive customers in the results. This functionality is part of some wider changes in WHMCS 7.7 designed to deprioritise inactive clients in result sets. Learn more in our recent Hide Inactive Clients Feature Spotlight. We've made it even easier for developers to work with Intelligent Search with a new structured response format providing developers with an easier way to integrate with and take advantage of Intelligent Search in their apps and add-ons. Learn more in the Intelligent Search Hook Documentation. We hope these changes will help your daily searches be more efficient and invite you to let us know any comments, suggestions or other requests you have for improvements in the comments below.